Here are surprising recipes for every day made using easy to find ingredients: mushroom and walnut samosas, oven-baked onion bhajis and beetroot and paneer kebabs. There are familiar and classic Indian recipes like dals, curries and pickles, alongside less familiar ones using fresh seasonal British ingredients, like Brussels sprout thoran, Gardeners’ Question Time pilau and green beans with cashew nuts and coconut. The best Indian food is cooked (and eaten) at home. 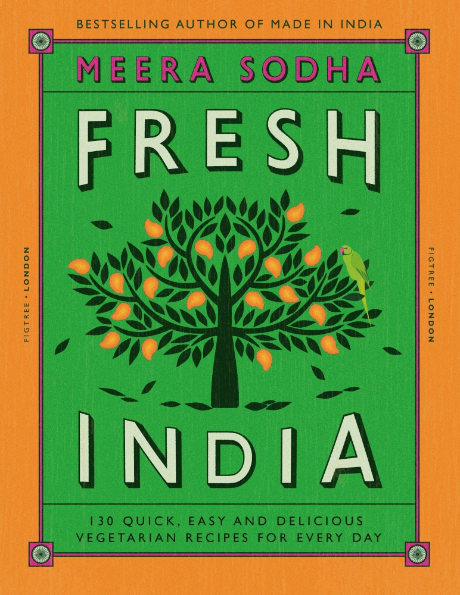 Real Indian food is fresh, simple and packed with flavour and in this book, Meera Sodha introduces Britain to the food she grew up eating here every day. Unlike the stuff you get at your local curry house, her food is fresh, vibrant and surprisingly quick and easy to make. In this collection, Meera serves up a feast of over 130 delicious recipes collected from three generations of her family: there’s everything from hot chappatis to street food, fragrant curries, to colourful side dishes and mouth-watering puddings. MADE IN INDIA will change the way you cook, eat, and think about Indian food, forever.